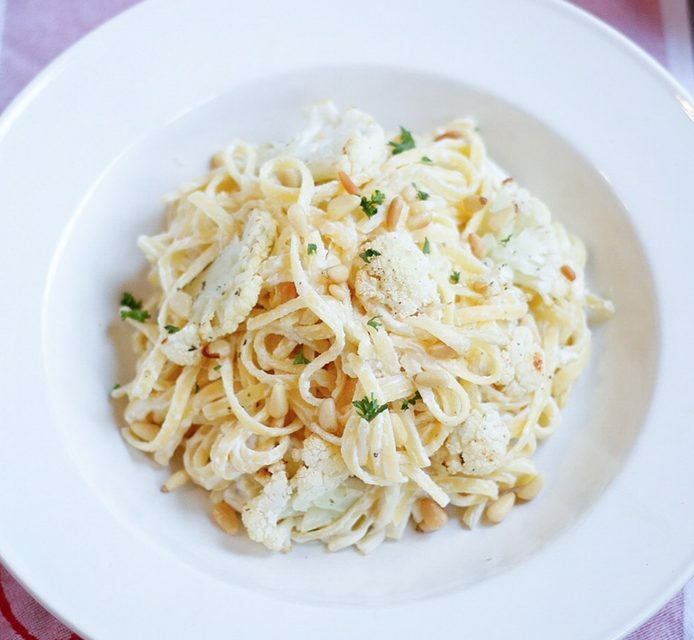 I’m all about efficiency, so right now we’re killing two birds with one stone- it’s National Fettuccine Alfredo Day and this recipe is the PERFECT meal to serve for a romantic Valentine’s Day dinner one week from today! 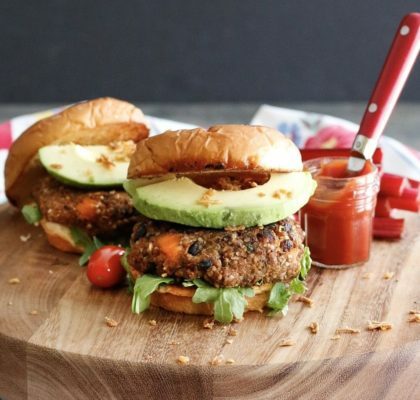 Don’t panic- you have seven whole days to prepare, I’m going to walk you through this, and I promise this recipe isn’t as difficult as you may think. It’s all in the preparation. First off, I have to give credit where credit is due. This is yet another recipe inspired by my time in Montreal this fall- it was actually the very first dinner I had there. Yea, I knew it would be a good trip after this meal. It was quite possibly the best alfredo I’ve ever had, and that says a lot because I’ve actually been to Alfredo’s in New York City, which is run by the people in Rome who apparently “invented” the sauce. The sauce starts with a base of vegan butter and cashew cream. 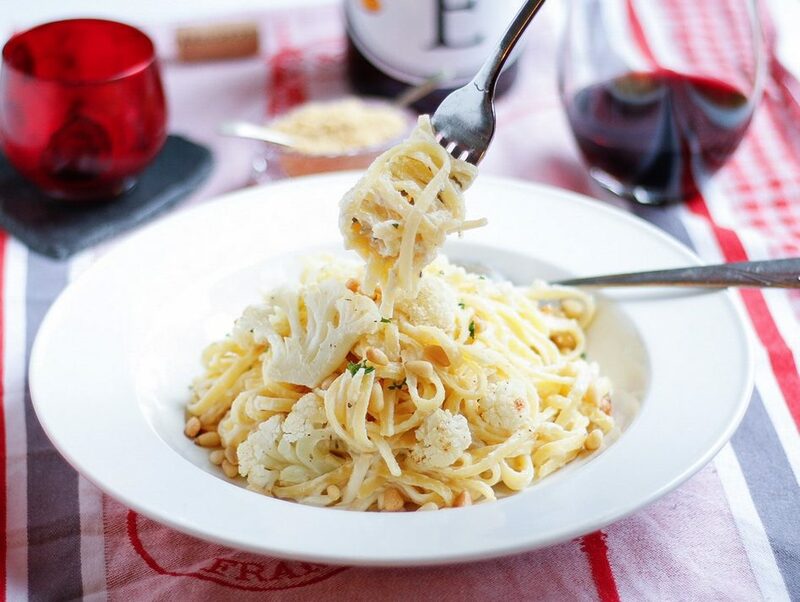 Then we toss in some roasted, season cauliflower, and the flavor really comes together from the crunchy, buttery, and slightly sweet pine nuts. Even though these nuts are expensive, they are an absolute MUST in this dish! Trust me, they’re worth it. I like to start with a vegan butter base because it adds a richer flavor profile, which is important since we won’t be using gobs of parmesan cheese, as traditional fettuccine alfredo calls for. After melting the butter down, you’ll add in the cashew cream, that you simply make by pureeing raw, soaked cashews with some water. Then add in some garlic, lemon juice, sea salt and black pepper, and you have yourself a dairy-free, vegan cream sauce that you’re just going to want to cannon ball into and splash around for a bit. From there you can let the sauce simmer or remove it from the heat entirely while you’re waiting on your pasta and cauliflower. To prepare the cauliflower, it’s really important to slice it thin- about a 1/4 inch, if that. That way the vegetable just folds seamlessly in with the noodles, and you aren’t getting a big hunk you have to bite in to. I love roasting cauliflower this way- I can eat an entire head without thinking twice because the pieces become like chips- perfect for snacking! 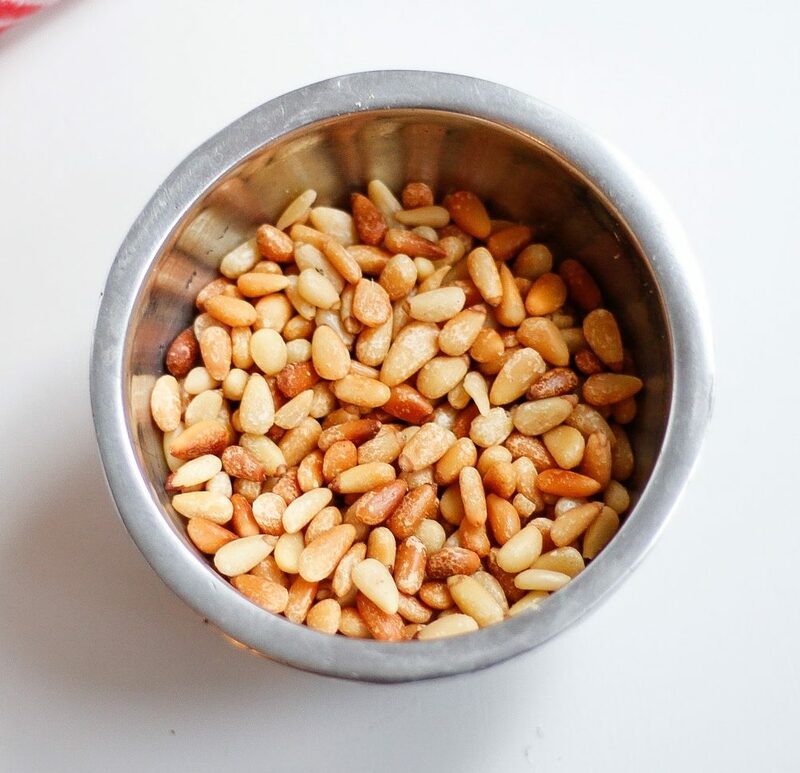 Now, let’s take a moment to talk about pine nuts, shall we? I truly believe these are the star of this fettuccine alfredo. Especially once they’re toasted, the flavor is life changing. But not only their taste, pine nuts have a lot of beneficial health benefits. Some studies have shown that they help support dieting by suppressing your appetite. These nuts contain pinolenic acid, a fatty acid that stimulates the intestine to release cholecystokinin (CCK), a hormone that turns off your feelings of hunger. 1/4 cup also provides about a quarter of your daily magnesium needs, a nutrient that helps relieve anxiety, increases energy, assists digestion, and helps with muscle soreness. 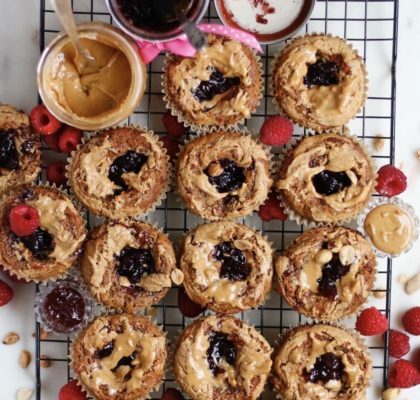 Have a convinced you to splurge on these babies yet? Fettuccine alfredo is the perfect date night meal, so don’t think twice about making this for Valentine’s Day next week! If you need a trial run, make it this weekend, and I guarantee, your friends and family will love you for it! (That is, if you share.) When I tested this out on my family, they absolutely devoured it. No leftovers? While disappointing after all my hard work, I always take that as a good sign. 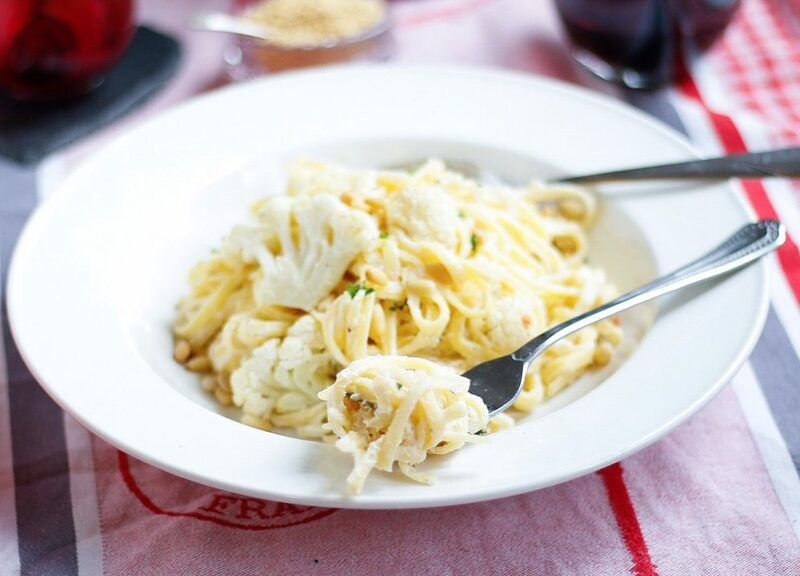 Cream + pasta…someone please tell me what is NOT to love about fettuccine alfredo?! 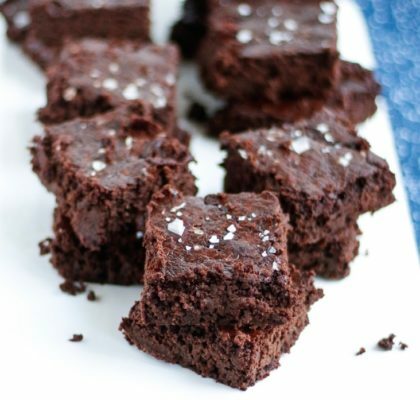 Especially since this recipe is made entirely dairy-free, egg-free, soy-free, gluten-free and vegan! You’re going to be sold as soon as you take your first bite. 4-24 hours in advance, soak the cashews with enough water so they are completely covered. You want the cashews to be extremely soft (so that you can smoosh them between your fingers) Otherwise, your sauce will be gritty. If you forget to soak the cashews, simply boil them for about 15 minutes. Once they are soft, place in a blender with 3/4 cup of water, pureeing until absolutely smooth- this may take a couple minutes. (If you need more water, add it 1T at a time). 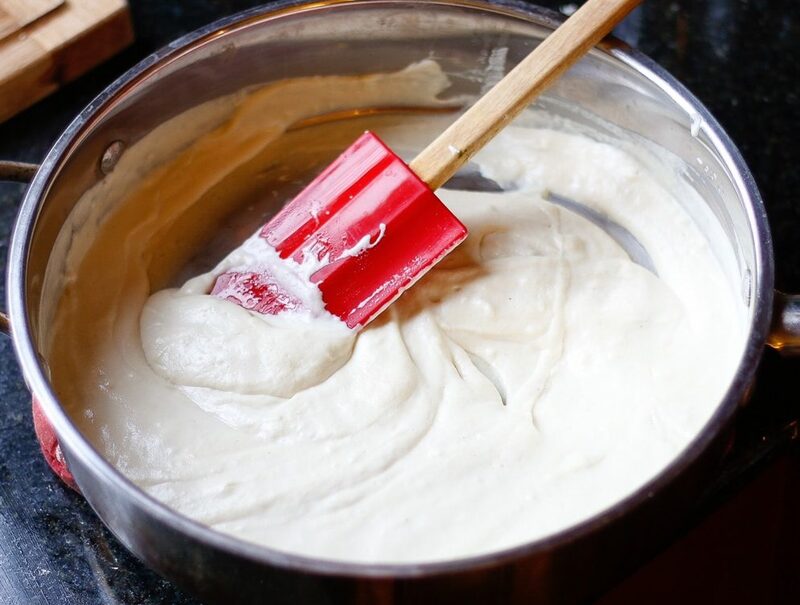 The cashew cream can be made a day in advance. If making your own vegan butter, go ahead and prepare that first too. This can be done up to a week in advance. Preheat oven to 425F. 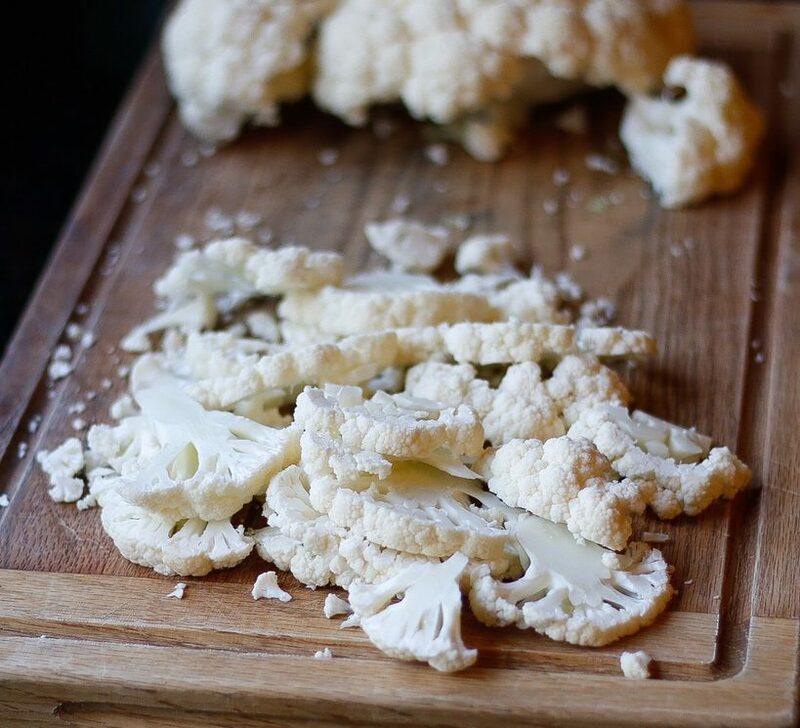 Thinly slice cauliflower, 1/4 inch thick or even thinner. Toss with olive oil, onion powder, Italian seasoning, and sea salt. Spread evenly on a parchment lined baking sheet, and bake 16-22 minutes, until soft and lightly golden. While the oven is preheating, bring a large pot of water to a boil, adding 1T of salt for optimal flavor. Cook the fettuccine according to package instructions for “al dente” (typically 11-13 minutes). While the cauliflower is roasting and pasta is boiling, heat a large sauté pan and melt the vegan butter (you can add more than 1/2 cup if you want it even richer). Add the crushed garlic, cook until fragrant, 1 min. Pour in the cashew cream and lemon juice, stirring to combine. Season with salt and pepper to taste, allow to simmer until ready to combine with other ingredients. 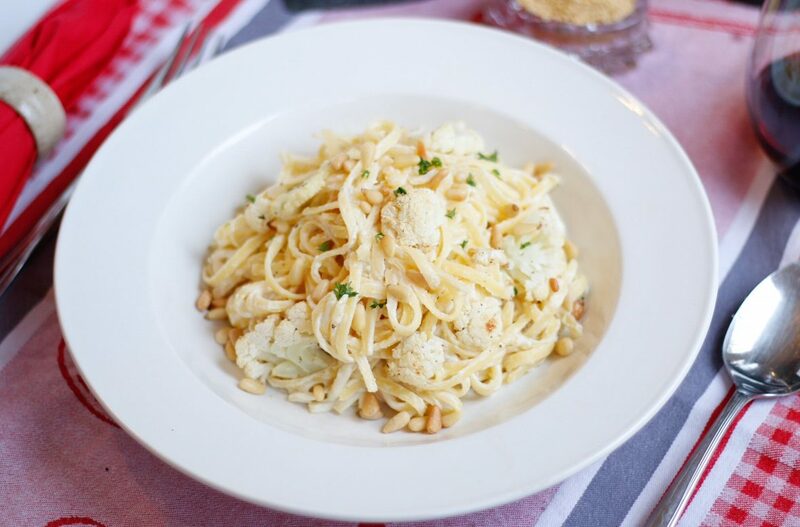 Finally, drain the pasta once it’s ready, and combine with the cauliflower, creamy alfredo sauce and pinenuts. Stir to evenly coat each noodle. Serve garnished with parsley, sea salt, and black pepper. Is there a substitute if you do not have pine nuts on hand?